LAWN: Nelda Sue Raper passed away on April 27, 2018, in Abilene, Texas. She was born in Abilene on October 21, 1942, the daughter of Lonnie and Lottie Bell Dean of Tuscola. She married Ronnie Raper of Lawn, on September 3, 1960. The two lived in Lawn where they raised their two girls, Susan and Vickie. Sue was a homemaker before becoming the City Secretary of Lawn, Texas for over 35 years. She enjoyed her work, helping people, spending time with her family, and working in the yard. 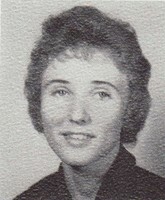 She is survived two daughters, Susan Sneed and husband Richard of Schertz, and Vickie Sparks and husband David of La Grange; granddaughter Skye Sneed of College Station; brother Johnny Dean and wife Reba of Odessa; sister Shirley Hayden of Anchorage, Alaska, sister-in-law Sylvia Rose of Waco; and many nieces and nephews. She was preceded in death by her husband Ronnie Raper (April 8, 2018); sisters Luda Fern Cooke of Elgin; Norma Jean Akeman of Rankin; brothers Vaden Dean of Tuscola; Jimmy Dean of Abilene; Winfred ‘Buddy’ Dean of Midland; and bother-in-law S.G. Raper Jr. of Claremore, Oklahoma. Not many people knew that my mother had colon cancer that spread quickly. She retired from 35 years as City Secretary of Lawn, and got cancer two years later. She only made it a year. My dad, Ronnie, had passed away only days earlier, and I think she just couldn't fathom life without him. They would have been married 58 years in September this year. She and my dad are in heaven, together, with no more pain. Until the day I see them again, I will have memories of the best parents a girl cold ever have!